Bond Economics: Primer: What Are Adaptive Expectations? Primer: What Are Adaptive Expectations? This primer defines adaptive expectations, as the concept is used in economics. The concept is most commonly associated with inflation expectations, but it can be applied to other economic variables. In this primer, I explain what some of the advantages and disadvantages are for adaptive expectations. Adaptive expectations for inflation are based on historically experienced inflation, with a greater weighting on more recent data. This definition sounds fairly reasonable, in particular when compared to the strong modelling assumptions behind rational expectations (which largely replaced adaptive expectations in mainstream modelling work). However, in practice, adaptive inflation expectations are calculated as the exponential moving average of historical inflation rates. (Or for those of you who have studied communications systems, the output of a first-order low pass digital filter.) When put this way, the defects of adaptive expectations become more obvious. 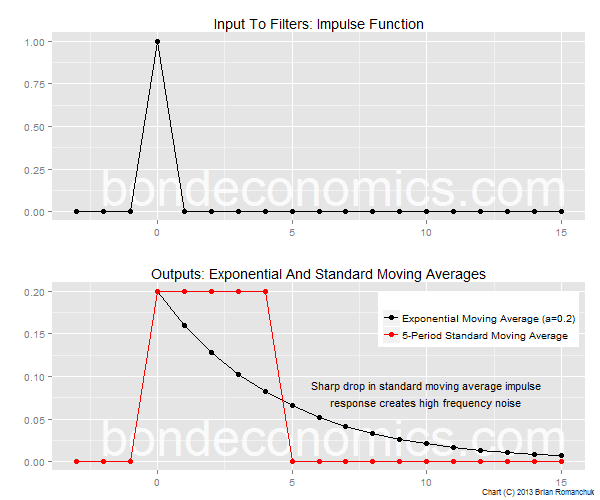 An exponential moving average is a pretty good filtering function, but it is limited in what it can accomplish. From the point of view of communications systems, the exponential moving average is the simplest possible filter to remove high frequency information from a discrete time series. Since the high frequency components of a time series are typically interpreted as noise, the output of the filter represents the “underlying trend” of the data. Unfortunately, the act of smoothing out high frequency components creates a time delay in the filtered output. For example, a standard moving average introduces a time lag of roughly one half of the width of the averaging window. Therefore, there is a trade-off involved: getting a smoother output series comes at the cost of a greater time lag in the output. The standard moving average also has a smoothing parameter associated with it; it is the number of observations you use to calculate the average. For example, the 3-period standard moving average at a particular time is given by the average of the last 3 values. In the chart above, I show the difference of how the output differs between a standard moving average and an exponential moving average. (The standard moving average is a 5-period average; the smoothing parameter for the exponential moving average is 0.2.) In both cases, the input is a time series that is 0 everywhere except for at t=0, where it jumps to 1. (This is an impulse function; the output in response to this function is known as the impulse response.) We see that the output of the exponential moving average decays at an exponential rate, whereas the standard moving average jumps up at t=0, and drops back to zero again at t=5. This gradual decay is a definite advantage. In response to a data spike, the standard moving average will jump when it arrives, and then fall back abruptly when the spike drops out of the moving average. This means that the output at a given time is sensitive to changes in the data at the either end of the smoothing window. In particular, this can make the output at a particular point very sensitive to the choice of the number of periods in the moving average. The sharp drop in the standard moving average impulse response creates high frequency noise, which defeats the objective of a low pass filter. As a result, the standard moving average is generally avoided in signal processing. If you need to embed a smoothed version of a variable in a model or indicator, the exponential moving average is probably the way to go (instead of the standard moving average). However, since people are unfamiliar with them, I use standard moving averages to smooth time series in charts. One of the basic properties of the exponential moving average is that it will always be below the maximum value of the series up to the point of the calculation. As a result, it cannot be applied directly to the level of the steadily-rising CPI index, as seen above. 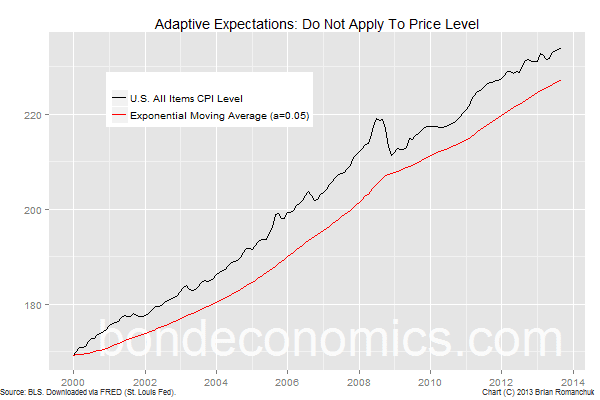 Instead, the exponential moving average is applied to CPI inflation rates. 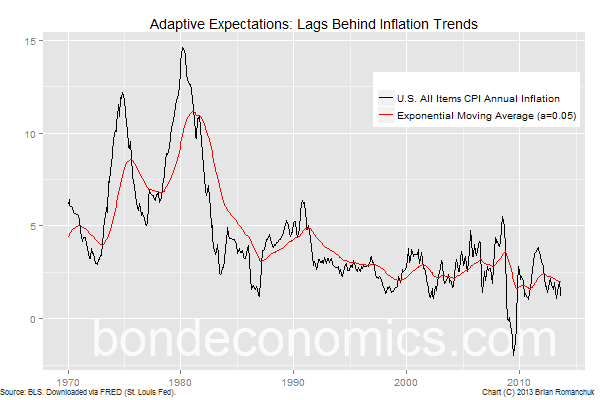 The chart below shows the exponential moving average applied to the U.S. CPI inflation rate, from 1970 to present. Recent performance looks reasonable, but the 1970’s experience showed the problem with the technique. Since the filtered series is always below the maximum up to the point of calculation, the series will lag behind actual inflation if inflation is rising. Additionally, if entities within a mathematical model use filtered inflation to set prices within the model, the model cannot generate accelerating inflation, unless the modeler adding other factors to the pricing decision to push prices higher. Therefore, it comes as no big surprise that adaptive expectations was abandoned during the 1970’s. The fact that model entities would not react to policy or other information which indicated rising inflation made the models a dubious guide to policy in an environment where consumers and businesses were hypersensitive to information about inflation. As Simon Wren-Lewis discusses in this article, it was inevitable that adaptive expectations would be replaced by something; and rational expectations was what appeared to fill the vacuum. I am generally in agreement with Professor Wren-Lewis. Economic models that are aimed to simulate the response to policy need to incorporate forward-looking behaviour. However, it would be very difficult to embed more complex inflation forecasting behaviour inside a model without the model turning into an extremely complex "black box" that we have no hope of understanding. That said, the assumptions behind rational expectations appear too strong, and kludges have to be employed to find solutions to even slightly complex models. In conclusion, adaptive expectations are a useful modelling tool, but their lagging nature means that they are not particularly well suited for generating inflation expectations.